Daily Zoom, Korea's first cartoon specialty daily, will soon join in the already cut-throat war of free newspapers in South Korea. South Korea has four free daily newspapers including Metro, Daily Focus, and AM Seven. "Daily Zoom will be published on June 21, 2004," said Mr. Lee Byung-Chul, president and publisher of the cartoon daily in a reception held to celebrate its launching at the Sejong Center for Performing Arts central Seoul on June 8, 2004. Just like the other free dailies, Daily Zoom will be distributed free of charge mainly at subway exits of Seoul and other major cities in the nation. About half a million copies will be distributed daily at morning and evening hours for the subway commuters. 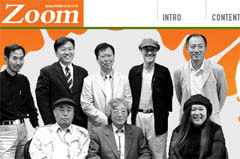 The 32-page tabloid edition of Daily Zoom will be printed at Segye Ilbo company operated by Rev. Moon Sun-Myung's Unification Church. About half of all pages will be allocated for advertisement while the other half will be filled with cartoons and regular articles by a ratio of 30 and 20 percent, respectively. Full color pages will amount to nearly 70 percent. So far the investment was estimated at 5 billion won (roughly 4.3 million US dollars), which is quite sizable amount of capital as an initial investment for publishing a free daily newspaper. About 10 percent of the shares are owned by Korea's prominent cartoonists and animation writers including Shin Moon-Soo, Kang Chul-Soo, and Koh Woo-Young. 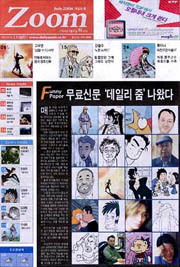 Shim serves as chairman of the Korea Cartoonist Association. The largest shareholder is the Military Mutual Aid Association, a welfare foundation for active duty service members, which funded 3.55 billion won (3 million US dollars) or 50.1 percent of all shares for the tabloid cartoon daily. Mr. Kim Seung-Gwang currently serves as the chairman and CEO of the association, which boasts 150,000 active duty career soldiers as its members. The non-profit association has 13 business corporations as its umbrella organizations. Its total asset is estimated at 4,000 billion won (3.45 billion US dollars). Last year, the association recorded 359 billion won (309.7 million US dollars) for its sales profits. Since its foundation in 1984 the association has aggressively expanded its businesses into stock market, real estate, manufacturing, and even fund management, incurring criticism from social and business circles. The other free dailies are showing negative reactions about the launching of another one by the association with an enormous funding ability. They are worried about the already worsening advertisement market for free dailies. "It looks like we have to vie with a dinosaur for a tiny piece of pie," lamented an official of a free daily, who wanted to remain unidentified.